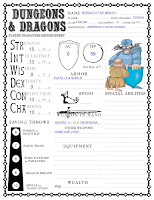 Once again, I find myself totally swamped with work today, but I managed to steal a little time during lunch to work on the continuing upgrade of my Moldvay rules-compatible Basic D&D self-filling character sheet to a full-fledged Expert D&D-compatible sheet. It's got a ways to go yet, but I've gotten most of the bits working the way they should (including fixes to some of the Basic sheet's code that apparently wasn't working the way it should have been). When the sheet's done, you'll be able to use it to randomly generate characters and parties of all allowable levels, and have them equipped with a variety of magic weapons and items from the B/X rules. Very good work! I'm looking forward to this.Did you draw the animated illo's yourself? I suppose I should just add a line about this to every post wherein I use these, given how often I'm asked this question; the illos aren't mine (I wish) - they're clip art from clipart.com. 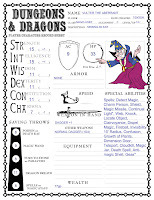 Great job, i'm going to use this character in one adventure, great blog! !